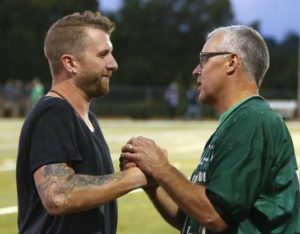 Neil Sanderson of Three Days Grace and Dave Pogue of Team55 share a moment at Friday Night Lights 2018. 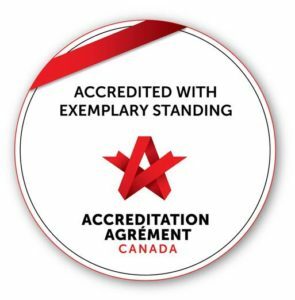 The Canadian Mental Health Association, Haliburton, Kawartha, Pine Ridge (C.M.H.A. H.K.P.R.) would like to sincerely thank Team55, Let’s Tackle Suicide Awareness, as well as all who contributed in any way to the success of the sixth annual Friday Night Lights, raising $17,500 for suicide prevention. On September 21, a crowd of more than 2000 gathered at Thomas A. Stewart Secondary School for Friday Night Lights, an annual Team55 event supporting suicide prevention through C.M.H.A. H.K.P.R.’s Assertive Outreach Suicide Prevention (A.O.S.P.) program. The program has served more than 100 individuals and families since launching in 2016. Through the great work of A.O.S.P. staff, none of these individuals has made a further attempt at suicide. They are all still living. Team55, founded by Dave Pogue, initially committed to raising $40,000 annually for two years to be directed towards suicide prevention. This commitment, which has now been extended for a third year, paved the way for the A.O.S.P. program, which costs approximately double the annual investment. Robin Martin, Parliamentary Assistant to the Minister of Health and Long-Term Care attended the event, witnessed the immense impact it has had and was immersed in the strong community support for the program. This followed a meeting where Ms. Martin and local MPP Dave Smith met with C.M.H.A. H.K.P.R. officials earlier that day to discuss the program.